Aimovig, the first CGRP inhibitor drug, was approved by the FDA on May 17, 2018. This is extremely exciting news, but there are a lot of questions swirling around as many of us are anxious to try this new medicine. For the most up-to-date information about Aimovig visit Aimovig.com. The site includes Frequently Asked Questions, information on how the drug works, safety information AND information about a co-pay assistance program and a two-month free trial program. Worried About Access To CGRP Inhibitors? 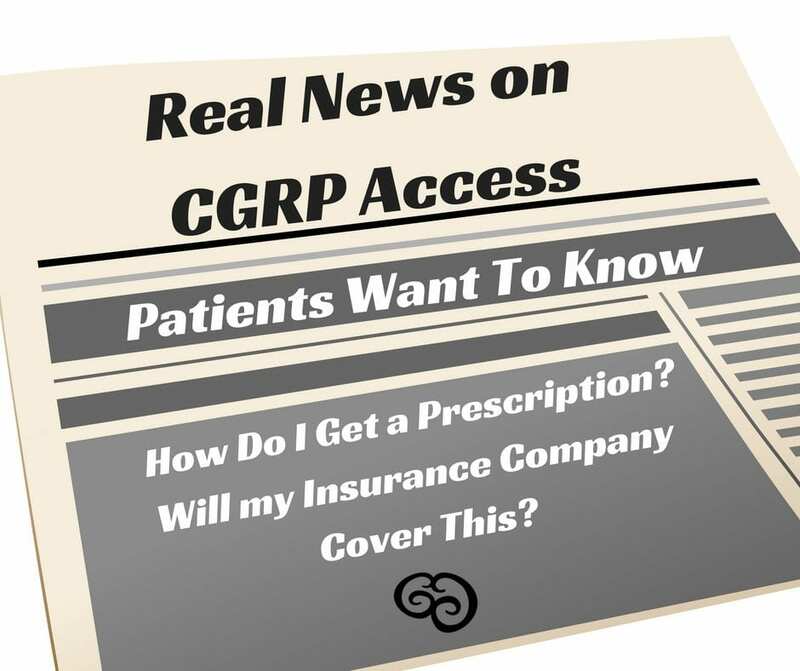 Many patient groups are working to address anticipated access issues to this new medication, including how to get a prescription from your doctor and to how to get your insurance company to cover it. However, these questions won’t be answered overnight. You are not alone and you deserve access to care that is appropriate for the disease you have. The information below may answer some of your immediate questions, guide you on steps you can take and provide resources to help you. There are many steps and a lot of coordination that has to happen between a FDA approval and when you can actually try a new medicine. While Amgen and Novartis already have Aimovig ready for mass distribution, for most of us, don’t expect to be able to walk into your doctor’s office tomorrow to get it. Some doctors are ready and prepared to prescribe the drug, while others are still finalizing their internal processes, criteria or guidelines for writing a prescription, and preparing staff for the additional mounds of paperwork for insurance pre-authorization. 1) Make sure you are seeing a headache specialist or neurologist, if not, make an appointment with one tomorrow! 2) Keep a headache diary. Use an app or an old school calendar, mark all days that you have ANY headache, not just the really bad ones. Have monthly tally of headache days ready for when you see the headache specialist or neurologist. 3) Make a comprehensive list of all prescription medications that have failed to treat your migraine. Have this ready for your headache specialist or neurologist as well. Call your insurance company to ask if they are covering Aimovig. If yes, have them look at your specific plan and ask them to tell you how much it will cost you. If you have a high deductible, you may have to meet that financial obligation before insurance will cover even part of the cost of the medicine. If your insurance company says they are NOT covering Aimovig, it’s possible that they will add it in the months to come – so keep calling back. Or ask for a supervisor who may have more detailed information. Many insurance companies will require prior-authorization. If your insurance company adds Aimovig to their formulary list, yet you get denied for coverage of the medication, call to find out why you were denied. Were they missing medical records? Did they have documentation of all of the medications you have tried in the past? Do they accurately understand how many headache days you experience per month? A phone call could clear things up instead of going through a lengthy appeal process. Aimovig is a preventive drug taken once a month. It is NOT a cure and will not work for everyone. Set realistic expectations. There are three other companies (Teva, Lilly & Alder) who are working on variations of CGRP inhibitors. These are expected to come to market sometime over the next 12 months. Aimovig was FDA approved for the prevention of migraine. Lilly is working on a CGRP inhibitor that hopefully will have an indication for cluster. Your doctor will decide if this drug is right for you. Clinical trials have shown improvement in those with migraine who are episodic, high-frequency episodic and chronic. However, your doctor may want you to try other therapies before prescribing a CGRP inhibitor. Interested in Getting Involved in Advocating for Patient Access Issues? And if you want to receive more information on CGRPs as well as programs and efforts of many patient focused organizations, subscribe to the CHAMP email list. *All of the information in this post is publicly available information. I’m on a plane home to LA reflecting on the last three weeks I spent on the east coast. Several opportunities came my way and of course it all happened at the same time! I am grateful I was asked to be part of events focused on community building, advocacy, education and collaboration.